Twists vs forward bends as compensation postures - who wins? Most yoga teachers are aware of the idea of compensation (pratikriya, which literally means counteracting). It basically means that in the course of the practice we challenge the body, breath, and mind in some way, and we need to take steps to return them back to the state of balance. Compensation mechanisms can take many different forms, but when applied to the asana practice, it usually means that we need to understand the demands of each particular posture – this gives us an idea of which part of the body gets stressed, so that afterwards we could choose a pose or poses that will de-stress it. The parts of the body that are stressed most often are the neck and the lower back, simply because these parts of the spine are not protected by the bony structures (like ribs protect the thoracic spine). This makes them more mobile and, as a result, less stable. So any pose, whether it’s a forward bend, back bend, twist or lateral bend, has the potential of stressing them if we are not careful. This means that in the course of any yoga practice we need to pay special attention to what’s happening with our backs and necks, and insert poses that would neutralize the potential stress on those areas. Which poses would do that? The viniyoga tradition views forward bends as universal neutralizers for all other directional movements of the spine. The forward bends are considered “the hub of the wheel”, with back bends, lateral bends and twists forming the spokes of the wheel. It means that we would never place a backbend and lateral bend next to each other, or a backbend next to a twist – there always will be a forward bend of some sort in between. What makes the forward bend uniquely qualified as a “universal neutralizer”? 1. The forward bend is the most familiar movement of your spine. We bend forward ALL THE TIME in our daily lives to lean, lift and sit. Other directional movements of the spine happen infrequently. For example, we do some twisting motions, but they are usually combined with forward bending (for things like driving, unloading the dishwasher or doing laundry). We are bending back only if we are reading a book while lying on our stomach or doing some intentional backward stretching. We don’t do any lateral bending at all. As a result, forward bending is the most comfortable movement of the spine for most people. 2. The forward bend is the primary curve of your spine. 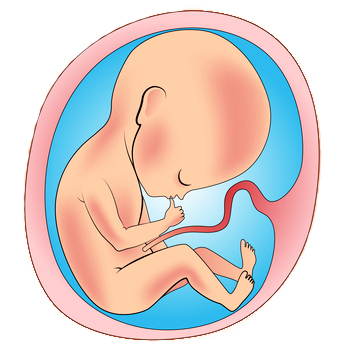 In a fetus the entire spine is curved in one continuous forward bend. Secondary curves (cervical and lumbar) develop when a baby begins to crawl and then walk to distribute the weight more evenly and cushion the body from the impacts of running and walking. 3. Every part of your spine as able to bend forward to a great degree. Below is the image of the potential range of movement in your cervical, thoracic and lumbar spine in each one of the directional movements. For example, your lumbar spine is able to bend forward 60 degrees, while it’s ability to twist is only 5 degrees. This greatly increases our chances of affecting our lower back with a forward bend, as opposed to the twist. 4. The forward bend is a natural resting position for most people. Most of us sleep on the side with the knees bent and hips flexed (this probably goes back to our fetus days 🙂 ). Very few of us would be comfortable sleeping in a twist, for example. 5. Forward bends are uniquely qualified to stretch our lower backs, that’s their entire mission. Remember what we said before? The primary intention of any forward bend is to stretch the lower back, and the secondary intention is to stretch other posterior structures, including the back of the neck. 6. Your body naturally craves a forward bend after a difficult posture. A natural reaction to a deep back bend (like Camel, for example) is to do a Child’s pose; a natural response to a deep reclining twist is to hug the knees to the chest. It feels good. Based on all the ideas listed above, forward bends are usually the safest movements for most people. Most people can hug the knees to the chest. In fact, life becomes really problematic if we loose our ability to bend forward because of an injury or disease. If that happens, every simple movement, like putting on your shoes or washing dishes can become a struggle. We need to maintain our ability to bend forward. Now few words about twists. The phrase that I hear quite often is that “twists relieve tension in the spine”. I do not know what that means exactly, and I would appreciate if someone explained that to me. Does it refer to this fact described by Mel Robin? He says that in spinal twisting “the compressional force will tend to dehydrate the spinal discs as disk volume and spinal length decrease on twisting. [ ] On releasing from the twist, the discs and organs will rehydrate with fresh, healthful liquids again.”  Is that what we are talking about? Here is a trick though. For that process to happen effectively, you need to lengthen the spine from both ends, or at least, have it in a neutral position. It works similarly to rinsing out a washcloth – you have to keep the fibers under tension by pulling on the washcloth from both ends. For most of us it is easier to return to neutral spine after a gentle forward bend (we do it all day long), then it is to do it after a back bend, for example. 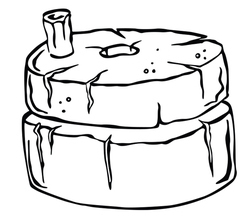 Basically it makes me think of two vertebrae with a disk in between as of a pair of millstones. When they are parallel to each other and squish the disk evenly between them – all is well. But if they tilt a bit (like it happens with vertebrae when spine is NOT in a neutral position) and proceed to twist/grind like that, it spells potential trouble for the discs. To use an example: let’s say you came out of a deep back bend – your spine doesn’t return to neutral right away. If you try to twist then and there, you might be grinding on those discs at an angle. Instead, if you hug the knees to the chest first, it is more likely that your spine will return to a neutral position and your twist will be safer after that. So to revisit the earlier statement that “twists relieve tension in the spine”, I would say that it depends on what came before the twist. And another issue is that, to quote Mel Robin again, “When the spine is twisted, there is an unavoidable twisting of the sacral plate in the sacroiliac joint, which tends to misalign it and loosen the ligaments upon which it is otherwise dependent for stability.“ This means that any twist carries a potential risk for the sacroiliac joints, so we need to prepare for them adequately and not do too many of them. Twists are not nearly as easy and comfortable for many students as simple forward bends, and carry some significant risks with them, which for me disqualifies the twists as safe neutralizing poses by themselves; combined with simple forward bends they would work just fine. What do you think? Very informative article. It is reassuring to know that the forward bend and knees to chest and childs pose are recommended after twists and lateral and back bends. I have been doing this all along but didn’t realize why other than it just felt like a natural progression. Thanks for the insight and the pictures. I will be analyzing my practice tomorrow to see if I miss any realignment opportunities! ps. I love sequencewiz!! I just started receiving the emails and I can’t wait for the next one!!! An excellent article about a complex topic. Can you say more about your views on the role of axial extension postures as compensation? Thanks! Thank you Clare! That means a lot coming from you 🙂 I will be talking in great detail about axial extension postures in the future, but for now I would just like to say that those of them that have the element of a forward bend (like Downward Dog or Urdva Prasarita Padasana – basically the poses where you have a 90 degree angle at the hips)) would work as well as forward bends. This is a great article, very detailed and informative. I am currently doing my yoga teacher training and I have started teaching a little bit, and all your posts are really helpful, full of great info! Thank you Anne-Laure, I am happy to hear that this is helpful to you! Congrats on starting your teaching career! Hi Olga – just came across your site – brilliant – love the detail – thank you. So refreshing to come across a Yoga website with really useful info that is mindfully and intelligently crafted. I’ll be coming back for more for sure. One question about forward bends … my thoughts are that after back bends, (especially a deep back bend) that the compensating forward bend be on the gentle side – i.e. not a deep forward bend. Plus do you have any thoughts that the forward bend not be with straight legs e.g. Janu Sirsasna or Paschomottasana? Thank you for your comment Neal and your kind words about my site! I am so glad we are having this conversation! The way I was taught about compensation is that it should match the intensity of the original pose (or slightly less), BUT in a cumulative way. For example, for a deep back bend like Wheel we would use Apanasana (knees to the chest), then Jatthara Parivrtti (reclining twist), and then Paschmottanasana (Seated forward bend). 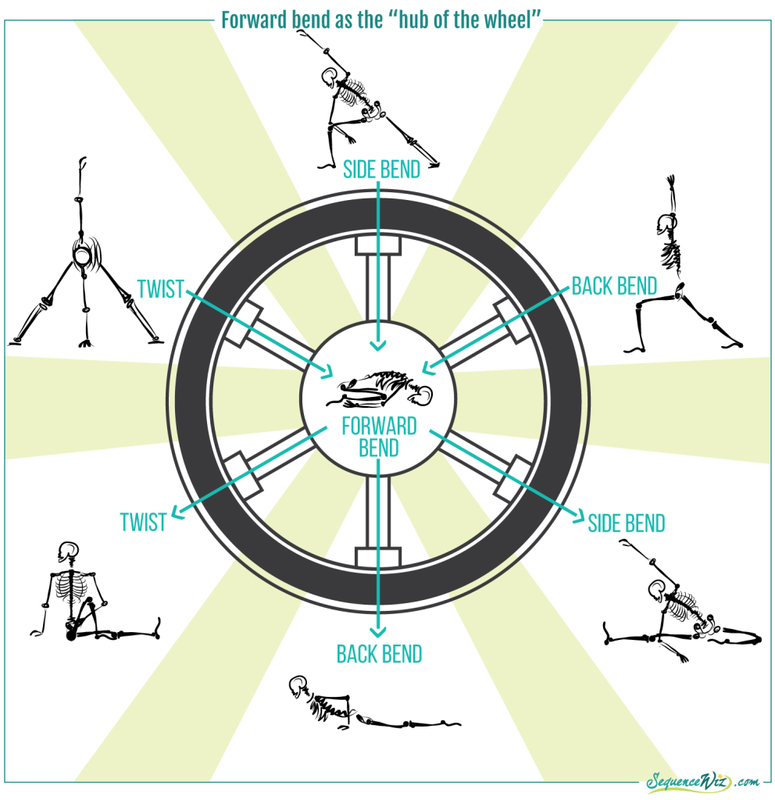 Each one of those poses compensates for a slightly different aspect of the Wheel. So, no, I wouldn’t jump into Paschmottanasana or Janu Sirsasana right of the bat, it would be too extreme, but with a cushion of few other poses it would work well 🙂 Does that make sense? Thank you again for another informative article. I believe that the 4 (5) main spinal movements should always be done with their natural movement integrity in place no matter the yoga posture no matter the person. Unfortunately this is not always the case. Very often we seem to struggle leaving our ego outside of the yoga shala or we simply lack the anatomical knowledge to move or to be instructed safely into forward bending, backward bending, side bending and rotations. Even when the instructions are correct it is not always so easy to check every single students correct alignment in a busy class. The spine is quite capable of moving outside its comfort zone especially when we use our arms to get ourselves deeper into a posture and will not always warn the practitioner directly of its risks and/or consequences. I believe it is one of my tasks as a teacher to point out that these risks are genuine and always emphasise that your spine is not interested in deep or far. Your spine is very happy with movement though! Thanks so much for your always insightful and informative blog posts. I love to geek out on this stuff and see what lands with me in my practice. I have been taught for a while that it’s not great to go from a deep back bend directly to a deep forward bend, example – urdhva dhanurasana straight to apanasana. My teacher will always stop off at something more neutral in between, perhaps supta tadasana in this example. Would you ever sequence directly from a deep back bend to a deep forward bend? The reason she has given for NOT doing this seems to be more about a nervous system/adrenal gland thing, and less about the safety of the spine. But I find that when I move between deep back bends and deep forward bends more than once consecutively, it’s very stressful for my lower back. I have an old back injury (herniated L4/L5) so I’m not sure if it’s just because of that. Any thoughts on this? Also, would you count several breaths in dandasana as a forward bend that could transition between a back bend and, say, parivrtta dandasana? Thanks so much! Love this blog. Hi Abigail, thank you for your comment! I wouldn’t call Apanasana a deep forward bend, but even with that said, after something like Urdva Dhanurasana it is nice to just lay on the back with knees bent for few breaths before we move on. And I completely agree with you – bending back and forth – from deep back bend – to deep forward bend – to deep back bend – to deep forward bend is generally a bad idea. In my tradition we usually build the intensity gradually, for example – mild back bend, slightly stronger back bend, then strong back bend – neutral spine – mild forward bend – may be a mild twist – stronger forward bend, something like that. I will be talking a little bit more about that next week, thank you for bringing this up! We call Dandasana an axial extension posture because it’s main purpose is to lengthen the spine, and sure, it can step in instead of a forward bend in most situations. True, Olga, and yogacharya Gary Kraftsow is always telling us to look for a posture within a posture. So after the backbend portion of urdva dhanurasana when one is supine with knees up & feet on floor that is a forward bend. Then taking a few breaths in that supine position the lumbar spine will gently move into more FB on exhale, then back to neutral lordosis on exhale. Excellent addition, thank you Charles! PS I forgot to say this was another great lesson! Thanks! Awesome! Thanks for citing your sources. It is part of deepening my practice.